Yesterday, we finally managed to go cycling despite the weather forecast. We took our capes but didn’t need to use them. I love being able to cycle straight out the gate and onto a country road. To go to the forest, you have to go up a little hill, but that’s OK now that I have a bike with lots of gears and suspension. Training helps too! I can still remember pedalling as far as I could beforehand to get up enough speed to save my knees. But it’s worth it when you get up the top. And you can take a break on this lovely bench surrounded with wild flowers – daisies, buttercups and clover. There are briar roses out everywhere. Don’t you just love this bush that forms a natural arch. 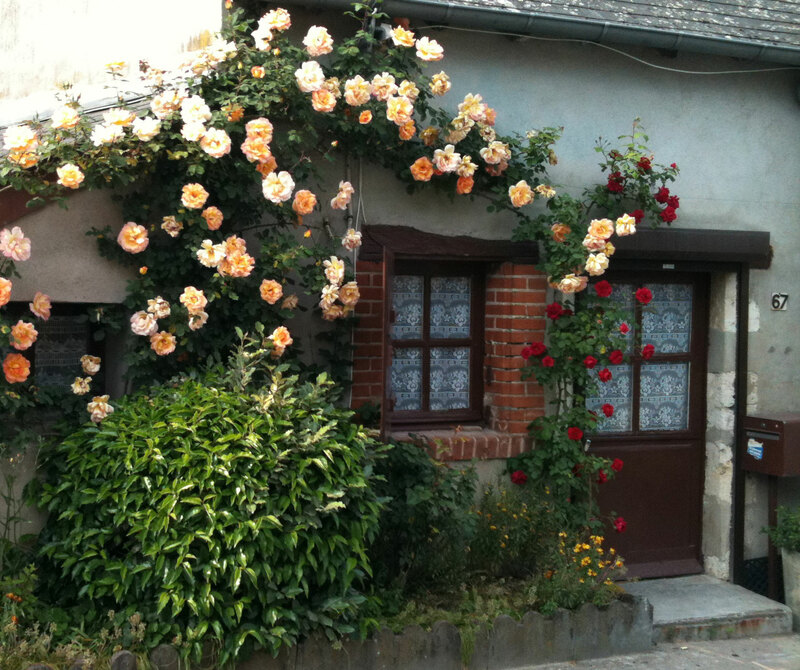 Then back through the village past delightful little houses with roses over the front door. Can’t wait for our yellow roses to bloom too! This entry was posted in Cycling, Loire Valley, Uncategorized and tagged cycling Loire Valley. Bookmark the permalink. Absolutely beautiful! What a great day you had…. 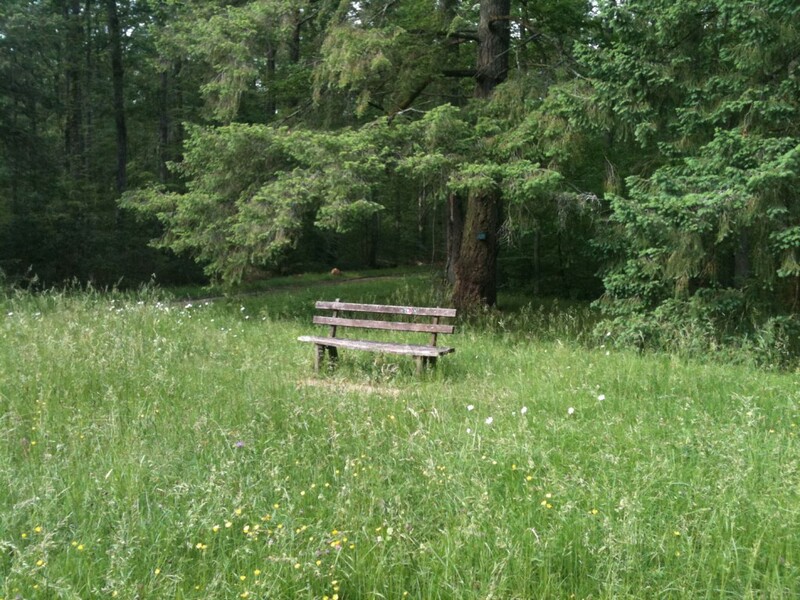 Ahh, the bench looks like such a peaceful place to sit and enjoy the countryside. You must enjoy having a get-away where you can escape the hectic pace of life in Paris! Seeing all of the roses in bloom reminds me that I must get to Bagetelle this year. It’s wonderful to escape the hectic pace of life in Paris, I agree, but I’m also supposed to be working (translating) and keep getting distracted. 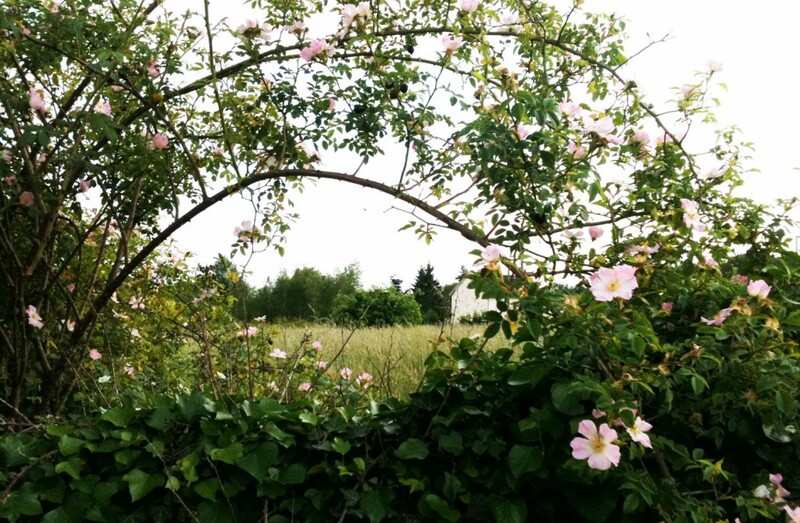 Have you been to the rose gardens in Hay-les-Roses? Quite spectacular! Looking forward to staying with you and cycling in Blois in a couple of weeks time. I am not too sure about hills. Do bikes have gears??? When did this happen? Ah, this sounds promising! Yes, they do have gears. I have 3×7 on my bike … They are what help you go up the hills :). But you might be reassured when you read tomorrow’s post. Not every bike path has hills, particularly when they are along the river banks and on old railway lines. Your photos are gorgeous and make me miss cycling there. Keep the stories and photos coming! Yes, now the weather’s improved, it’ll be easier to do so!